Here is something one can relate to as 'Death By Chocolate'. Dense, terribly chocolaty and a chocoholics dream cake. Use your favourite kind of chocolate to ensure its success. I like dark chocolate best and generally use a 50% cocoa content. I recommend you also try a dark rather than milk chocolate if you are opting to recreate this old decadent dessert that has always been much appreciated by the old and young alike. Eating it at room temperature is best, But again, a personal preference. There are many who prefer it chilled. I am guessing you will want to try that out for yourself? Prepare two 10 inch/30 cm round pans with parchment and butter. In a pan over the lowest heat, melt together the butter and chocolate. It should not boil. Keep aside. In a large metal bowl whip the egg yolks and sugar for approximately 8 minutes; until light in colour and it leaves ribbon like trails. In another large bowl beat the egg whites until soft peaks form. Prepare to incorporate the 3 parts of the cake. Pour the melted chocolate into the egg yolks. Once it is all mixed in, start folding the egg whites in thirds. Start with 1/3rd, gently and lightly fold them into the egg yolk+chocolate mixture. Repeat with the remaining. Bake in the oven for 22 minutes. Test the cake in the center of the cake with a skewer, before removing. It should be clean. In a pan heat together the cream, butter and sugar until just warm. Do not allow to boil. Add the pieces of chocolate into it. Cover. Turn the stove off and leave to melt for 10 minutes. Mix lightly just until smooth. Allow to cool until it is thick yet soft enough to apply on the cakes. Once the cakes are cooled. Loosen the sides, overturn on a cake plate and pour 1/3rd of the ganache over the cake. Place the second cake over the ganache and continue to ice the cake with the remaining chocolate ganache. Refrigerate if the cake is for the next day. Remove for at least an hour or two before serving. The cake will be dense, yet soft to eat. All eggs should be at room temperature for best results. Egg whites must be clean as a whistle. Even a drop of egg yolk will not allow them to beat well. The bowl and the beaters must be clean for success. If your sugar is slightly large, run it through a grinder you may have. If you are unsure of putting the chocolate on a stove, put it on a pot of boiling water and allow it to melt with the ''steam''. First reduce the heat to simmer, then place the pan of chocolate over it. Do not allow the pan with the chocolate to touch the water. Remember we need to allow the steam to rise. This cake is dense and rich. One can only eat little slivers. Although this cake will make 10 generous slices, more can eat from it depending on the age group. A bowl of fresh berries, whipped cream, vanilla ice cream, a cup of coffee all go well with it. I often like to add a few drops of cognac or rum in my chocolate ganache. It cuts the sweetness and enhances the chocolate flavour. Add this after it has all melted and before you allow it to cool and turn into the right consistency to become a ganache. 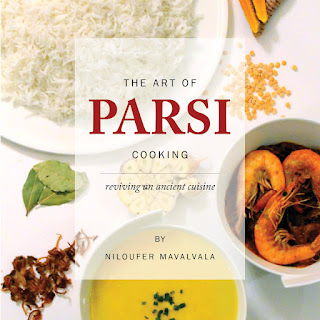 For recipes and origins on Parsi Food refer to my cookbook The Art of Parsi Cooking; reviving an ancient cuisine. Dilnavaz Shroff Congratulations Niloufer! Terrific milestone! For me there is an obvious choice of my favorite....the absolutely yummy, moth watering chocolate cake you made especially for us! Kudos!